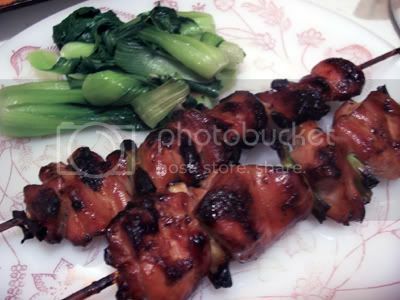 This photo of skewered and grilled chicken thighs is submitted for LaPiS (Lasang Pinoy Sundays) food photo event. Visit cesSpices for a list of other LaPiS entries. I found out about LaPiS only this week. I’ll try to join every week. Hey thanks for visiting my blog, you have a wonderful site here, can’t take my eyes off! I really need to get a new grill! I could almost smell that! Hmm…..haven’t joined LaPiS yet. chicken BBQ! i remember Aristocrat tuloy! with Java rice! is that bok choy on the side? looks good together! JMom, I suddenly remembered atsara when I saw your entry. I love the combination of pickled shredded papaya with grilled chicken or pork. Going around seeing all these grilled food is really making me hungry!